We believe that by sharing the story behind that very special photo we can connect more people on a basic human level. We would love to feature you. So if you want to join, please email/dm us your photo, a small caption answering the question and the location. We look forward to reading your story. A lot has changed it my life in the last year, last month and last week even more so and it truly has opened my eyes to a TON. As most of you know I am a Social Worker, though have been working in my local school district for 8 years now as either a practicum student, Educational Assistant or Youth Worker… and I am going back to school next year for my teaching degree. I like to think that even if I can’t always teach the standard curriculum very well I sure as HELL will be able to teach some valid life lessons, give advice and tell some life changing stories that I hope will influence and empower my kids in the classroom. ‘The photo I would keep (pictured above) – is one taken during my first solo trip I ever did – I saved up for months and months in order to make enough to afford such a trip. I was working FT at an elementary school during the day as an EA and then working PT at a restaurant as a waitress in the evenings just to save up money. Every tip I made I remember when into a glass mason jar on my shelf and then I used that money to buy my round trip ticket to Thailand. I appreciated absolutely every single second of that 4 month trip which took me to 5 countries in South East Asia cause I Worked extremely hard for it and paid for it with my own money. No one was ‘payingggg’ me to be there or paying for it. There was no ‘work’ involved. Like most of my trips had been now over the past year and a bit due to my growing Instagram account, following and engagement…. I was present every SINGLE second of those 120 days in SE Asia – with every person I met and every place I visited. I also kept a journal – one I wrote it every single day on that trip. I would say is my most cherished possession I have in my home. I kept every single plane, boat, or entry ticket, little pieces of paper from here and there, I wrote poetry, drew photos, wrote notes, jotted down my feelings day to day, and where I was, places I stayed at. Just EVERYTHING. That was how I reflected on my travels and daily experiences. The photo I chose speaks ‘peace’… I was at peace with myself and at peace with the the world around me. I was 100% OK with just living day by day. 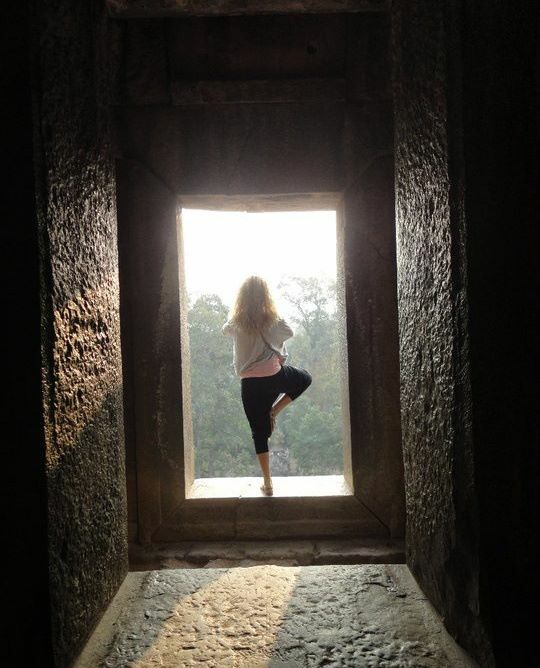 The photo was taken in Cambodia at Angkor Wat, one of the 7 Wonders of the World. It was a 4 month solo trip through Thailand, Vietnam, Indonesia, Laos and Cambodia about 6 years ago when I was 19. My first ever ‘real’ BIG trip. I did NOT take a cell phone with me. I had a small little point and shoot camera and valued every single photo I took. And were they by any means ‘perfect’ photos? NOPE, they sure as HELL were not…. which most people seek out now. Spending hours and planning trips around capturing that ‘perfect’ photo, something I am guilty of having done as well… but reality is life sure AIN’T perfect, and I certainly am NOT perfect. I have flaws. I have sad days. I get down. I get self-conscious. I get anxiety when things don’t go as planned or I don’t live up to expectations that I have set for myself. I am only HUMAN, just like everyone else… and that’s also what makes it fun and interesting. All of these photos I am including in this blog are raw, cultural, true photos from my SE Asia trip and when I look at them I see a present, content, very happy girl who’s longing for adventure, experience and grateful for every moment of it. When I do look at my photos from the past year of trips I see a lot of anxiety, frustration and you know even unhappiness… as happy as I thought I was at the time. In the end things don’t matter, people and relationships do and the true connections we make along the way. One month into this trip my camera got wet when I was in Laos floating down the Luang Probang river and I lost the entire memory card and about 1000 photos due to water damage and I didn’t even care …. and well if that happened now while I was gone on one of my ‘working’ trips I would probably would have had a big anxiety attack cause I’d be letting people down and wouldn’t be able to fulfill that contract or make that post… or whatever it may be. Being so focused on taking photos while traveling truly does take away and not allow us to be fully present and enjoy every single moment like we should… cause hey tomorrow is NOT promised and I would be quite upset leaving on the note that I did not live every day to the very best I could. The locals would all laugh at me and my blonde crazy hair, they would want photos with me and would often pet my arms… don’t think they are so use to blonde hair? Got to love the locals! I think if I had traveled with friends or for work I would not have spent as much time interacting with the local people. This trip was one for many ‘first’… from scuba diving to bungee jumping… Those memories are near and dear to my heart (even if both scared the CRAP out of me). I could say SO much about this topic… During this SE Asia trip I didn’t feel the need to let people know where I was or what exactly I was doing…. a feeling I and many other people seem to get these days with social media being so avid in our lives… whether it be through Twitter, Instagram, Facebook, Snapchat… I ask myself why do I need that gratification? Why can’t I just 100% be okay experiencing it on my own, without peoples approval or likes and what not? This is something I have spent a lot of time reflecting on in the last while and I believe a topic that many people would go back and forth about. It could turn into quite the sensitive topic for many but hey maybe those buttons need to be pushed and get people thinking about. I have been on a few ‘work’ trips in the last year and I can truly say I didn’t deep down TRULY enjoy them as much as those trips that I put every dollar of my own into and lived present in… We do lose out on the purpose… also when we are traveling to places that may or may not have been the first on our list of places we really wanted to go to experience. I am NOT saying I don’t appreciate every single opportunity I was given, all the gear I have been sent and contracts I have made and relationships I have created all over the world. I realize just how blessed I have been to have had the opportunities I did and look… now I have so much experience and have learned so much about myself and what it does mean to be truly happy. Am I still learning? YEP… and will I continue to learn? YEP… But I am so grateful for every single thing I have been through cause it has brought me to where I am now and I would like to think I am a pretty decent person. One with STRONG values, a rewarding job empowering kids, an amazing supportive family and friend group, a healthy body and a passport full of stamps and an endless list of life lessons and advice. Like I said I am SO far from perfect…. and I do have my bad days just like everyone else even though based off my Instagram it may look like I am ALWAYS happy… which also made it hard when I was traveling and working. I always did have to put on that happy face and well ya sometimes it was fake. Though as of today I and am going to make a very conscious decision to live every day to the very best and be present at work with my kids and people who cross my path on a day to day basis. Because they are the ones that deserve my utmost attention and words. I am guilty of having missed out on a lot in the last while cause well…. my head just GOESSSS and GOESSS and I start thinking down the line, worrying about things and getting ahead of myself, whereas if I just lived for today those issues would come and sort themselves out when they were suppose to. A lot of my worries stems from living up to expectations I have set out for myself… and well truth is those aren’t realistic. I’m me…. perfectly imperfect. When I got the email this morning I found it to be extremely weird timing and am happy this man sent it, whoever he may be. It has been a HUGE eye opener for many reasons and it’s something I had been thinking bout for a while now. I do hope that whoever reads this will take it all to heart…. and hey if you really do agree with it and think its an important issue DO share it and spread the word. Our future generation will thank us and we need to start thinking about that. Social Media can be very beneficial if used in the right way, though the way I see our youth using it often is scary and they need to know the pros and cons to it and when to leave the phones behind! I just want to thank you all for reading this and hope I did make an impact and got those little hamster wheels turning upstairs. Just a little food for thought going into this weekend! Great read – very honest. Thank you for sharing Brooke! Had to share. This topic comes up often in our house as we strive to be on of the “Last of the Mohicans” in our teenagers circle of friends to give in to the need for the cell phone. Even without they seem to find a way to get pulled into the vortex of watching every single facet of their friends lives be broadcast for all to see, judge and absorb. I love this post and shared it in hopes that people take a few minutes to step back and pull away and actually spend TiMe with their kids to discuss how social media fits into the true importance of every day life and give guidance as how to use it for good. It’s a definite super power that can turn evil without you even knowing it. Thanks Brooke and mystery email man. I love your posts and hope that someday my son has the opportunity to see some life through the paths you have taken. Keep inspiring, I’ll keep guiding!